KOKLIANG HERBAL SOAP Lot of 2 Condition : New Size :90g / bar Quantity : 2 bar Kokliang combines the ancient secret of chinese herbalism with superb herbal of chinese legacy. Kokliang soap contains natural plant essences to help nourish and protect your skin. It quickens the blood and slowing down aging. Works to clear and prevent acne blemishes. Wash away bacteria, remove excess dirt and oil. Your skin will look and feel healthy, clean and radiant. Benifits : 1. Remove the acne from face, back and chest. 2. Prevent dark spots, blemish, wrinkle, freckle. 3. Prevent rash on face and body. 4. Sken smooth and white. 5. Skin look younger. 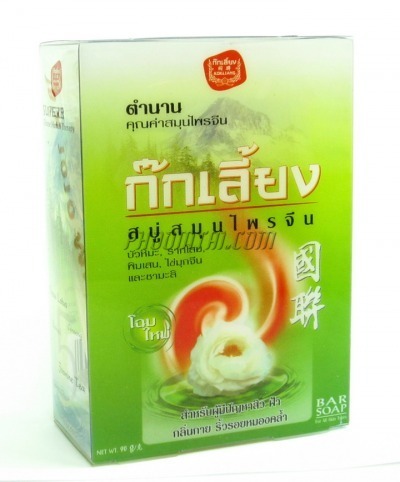 Ingredients : Snow Lotus Cinese Pearl Borneol Jasmine Tea How to use : Using for your face and body, gently massage the skin and leaving it for a moment. Then rinse with clean water. * All payment should be made within 3 days * Accept only PayPal for payment * Ship to Worldwide (*** Except ITALY FRANCE ***) * One Price Shipping to worldwide * Ship by Airmail from Thailand * Ship in 3 business days after received payment * It take about 14-25 days to most countries No return Accept FreeAuctionDesigns.com Free Auction Template Designs More!